Emergency smores......there is such a thing. Jordan had sat around the fire pit with Rick yesterday afternoon, today, we had discussed smores.....tonight he called sobbing, an urgent request for smores. I had planned on picking up the big marshmallows and chocolate bars tomorrow, we only had miniature marshmallows and chocolate chips, I did have graham crackers......but what the hay, I can fly by the seat of my pants. We set up the smores factory on the kitchen counter, a bowl of chocolate chips, graham crackers and Jordan would be the "smasher". I slipped tiny little marshmallows on a very long fork and held it over the flame of the gas stove......where there's a will, there's a way. Jordan was delighted! We made seven smores, with the promise of bigger better marshmallows and proper squares of chocolate tomorrow.....and a fire in the fire pit.......ya'll come. Unless you have worked retail during the holiday season, you will never know what I am talking about......ten and twelve hour days, three inch heels on concrete floors, trying to make people happy who will never ever be happy with their purchases because they are exhausted and so are their credit cards. I loved working with apparel and make-up, most of the time it really was fun, until the holiday season began......and then it seemed, even the customers who were always nice and friendly went to the dark side. So for me, shopping on line or going to the mall mid-week, mid- December keeps me sane and happy. I know that many of my friends love the thrill of an all day or all night shopping spree......it just makes my blood sugar drop. Now, before my mom died, she and I did have some great times Christmas shopping, and I miss those shopping days. Last year, Rick did a book signing in the mall, while he signed books, I did our Christmas shopping......I do love shopping for our great nieces, buying clothes for them is fun. I have made a Christmas list of sorts......and my courage is building, I will face the mall soon......just not this weekend. For all of you who braved the cold, the crowds and the craziness.......kudos to you....the stores love you. I hope you found every bargain you searched for! The meal was wonderful......the company even better. If your day was half as good as mine, then you are smiling. Grateful for all of you tonight, thank you reading this blog. 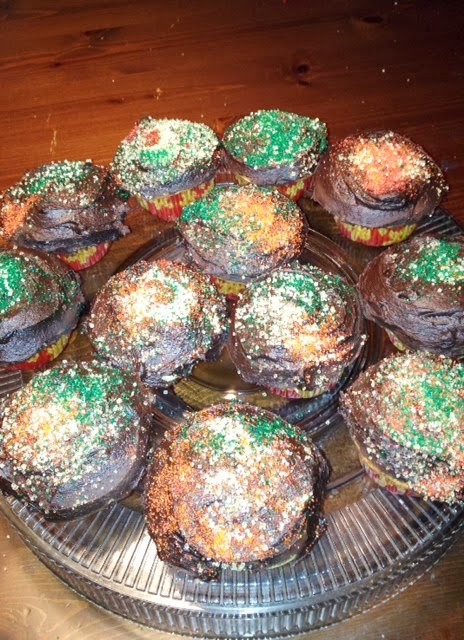 Jordan came by this evening to do his share of the Thanksgiving meal, he decorated the cupcakes......swirls of green, orange, red and yellow sugar crystals on dark chocolate frosting.....his version of fall cupcakes. Of course, he had to take a few home ( to make sure they were good). But we had a wonderful time......he was also excited when he saw the stash of fun stuff I bought for all the kids to play with tomorrow.......velvet posters to paint, coloring/game books, playdough, wooden blocks, and Charlie Brown's Thanksgiving video. A houseful of family and friends should arrive around noon tomorrow, I am so looking forward to seeing them all......and enjoying a table laden with food. The turkey has been soaking in brine all day, I will be up at the crack of dawn, getting things ready. Our first Thanksgiving at home........I am grateful for the opportunity to share our home and our table with those who come ........Wishing you all a bountiful and happy Thanksgiving......safe travels. Still rainy and very cold......there was excitement and sadness during classes today......for some the holiday meant a pass out, a chance to go home and see family and friends......for others, home is too far away or they have not been at the facility long enough to have a pass out. Even for those getting to go home, there is an undercurrent of nervousness, of self-doubt, fear of judgement or returning to old habits. These are the days I teach with extra love, and care.......these are days we should all treat each other with extra love and care. Holidays can be brutal, stirring old memories, hurt feelings and pain for many.....while others just want a Hallmark holiday, which only exists in a Hallmark movie. I think back to holidays past, of the stresses and fears I dealt with.......so long ago, and sadly, so unimportant now. I was such a coward back then, could never say no, could never voice the holiday I wanted. If there are regrets, for me, it is the regrets of holidays past.......and unlike the movies, there is no going back. It took many tears, illness, deaths and the passing of years to acknowledge what I missed each holiday season. Too many places, too much to do, too many gifts bought for all the wrong reasons.....but now, I know, I understand......how important it is to celebrate the holidays in the now, to celebrate within your rim of reason and not someone else's, to spend time with those you truly want to spend time with, to create your own traditions. your feelings and thoughts matter, take the time to enjoy the magic......the lights, the food, the sounds, the colors, the joy......each day, take a few minutes for yourself.....it will all be over in the blink of an eye. Find your way to celebrate, your way to make your holiday memories. days, I wish there were no calendars......just the passing of day to night, season to season. Maybe then time would not go fast. This weekend, I paint Christmas cards, the design is worked out........the hard part......getting started. Once I actually start painting, everything goes smoothly. But, I don't start them until after Thanksgiving. I am a true believer that Thanksgiving should get its fair share. All my fall decorations are still up, though several of our neighbors have decorated their Christmas trees. I hear the rain, falling on the tin roof.....it is so cold tonight. When we came in from my community class, we saw five small deer in our neighbor's yard......they looked so small and cold, I hope they find shelter and food tonight. It doesn't seem to be a night fit for man nor beast. Fall seems to have faded into winter in the past twenty four hours. There is even talk of snow for tomorrow night. then it is easy to understand how precious time. Wishing you all tonight......all the time (life) you need, all the time (life) you want. It was a wonderful cd concert......a good crowd, friends we had not seen in a very long time, tonight reminded us of why we play music......it's just so much fun. Hope that all of you had as much fun today as we did. My private class that I often teach on Friday mornings got cancelled, rain was moving in and after we rehearsed for our gig tomorrow night, I decided I would be very productive today. The guest room, sometimes ends up as the catch-all room and it had been a while since I had spiffed it up.......I did that today. It never fails during the holiday season that we have overnight guests at some point........and thus I go into a tailspin if the room is not ready. I have spent a lot of time the last few days thinking about how stressful some of our holidays in the past have been. This Christmas, two years ago, my world was turned upside down when my pulmonary doc sent me to an oncologist. I don't have cancer, but I will undergo a type of chemo, once a month for the rest of my life.......these past two years, I have gone inward many times. to take over our lives and spoil all those precious moments could be avoided. That Christmas two years ago, I decided the holidays would be different, if I lived to enjoy any more. I would do the things that were important to Rick and me and let go of what wasn't........our last two Thanksgivings and Christmas have been different and I can honestly say I have enjoyed them greatly. This Thanksgiving I am cooking for my brother and his family and a couple of friends from work. I have made my grocery list, my menu and am excited to have Thanksgiving in our home.......after almost forty years of marriage, this will be our first Thanksgiving at our house. I am grateful and happy to finally after all these years, cook Thanksgiving lunch. clouds filled most of the sky, but there soft streaks of pinks and yellows......I gathered my students together at the edge of open field and talked with them about mindfulness, what it meant to fully be aware. We set the parameters of our walk, came into mountain pose, brought our awareness inward to our bodies......then I began to discuss mindful walking......beware of what it feels like to walk on grass, gravel, dirt, to feel and hear the crunch of dry leaves, twigs under the foot......feel the wind, the dampness on your skin........hear every sound, leaves rustle, birds, dogs barking, traffic sounds........notice your feelings, your thoughts, your breath. We walked almost twenty minutes......each found their own path to follow, each their own mindful space. We went back to the yoga room, did a few asanas, and relaxation. Almost every student told me how wonderful the class had been. and allow yourself to be aware.......of everything, your body, your movements, your breath, the sounds, the sights, sensations.......it will change the way you see and think about your surroundings......a twenty minute walk can truly be mind changing. We practiced this afternoon, it is so exciting........getting ready to perform Saturday night. We are playing our CD release concert at a local coffee house in Birmingham and many of our friends have said they will drop by. Nothing better, than playing music and seeing friends. Tonight is a short post, forgive me. What is it about spending time with a doctor that is so exhausting? A cup of hot tea and a warm cozy bed await me. I have seen two of the most beautiful owls in the past week.......a few days ago, a white owl flew in front of my car, and sat down on the side of the road.......I stopped Ingrid to admire his beauty. The snowy owl looked at me as if he knew me.....quite amazing. Last night, driving home from work, about five miles from the other sighting, another owl flew across the front of Ingrid. He was spotted. I feel as though Mother Nature has sent me two gifts. These birds were so beautiful, they took my breath away.......and honestly, I felt as though something really special had taken place. Sometimes our lives are so busy and hectic, we forget about the beauty that surrounds us, about the beauty that is truly everywhere if we take the time to see it. I was reminded by the visit of both owls of the incredible beauty that lives here in my little neck of the woods. I told one of my classes today about the owls.......I told them how blessed, how special I felt to have seen them......as though somehow, the universe had sent me some sort of sign. Sometimes, we need signs....or at least what we think are signs......life gets tough, we feel a little lost......if we keep our eyes open, just when we need it the most......there it is, an owl or two. 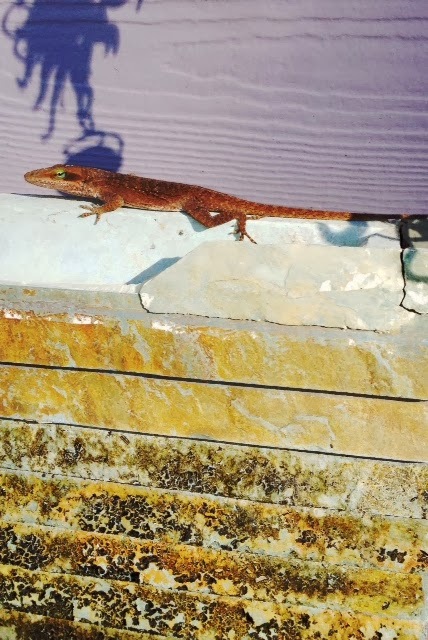 I walked out the back door this morning to take a walk, and here was this guy, catching some rays, hanging out on our fountain. The wind chimes cast a strange shadow behind him, but he didn't seem to mind. Do you ever think about who you are, why you are that person and how the heck did you become who you are? I know, for me to even ask that question, I must have too much time on my hands. But maybe teaching yoga and being a musician pushes me to ask questions like that. I think we are a living collage, every experience, every place, every person, every book, every movie, every song, every word we have spoken or heard has created who we are today. That is why we are not the same as we were ten years ago or will not be the same ten years from now. We are all a little bit like human play dough, and life is constantly molding and shaping us. Change is taking place, even when we resist it. There are bits and pieces of me that have remained constant, but there are also parts of me that did not even exist a few years ago.......teaching and music have brought so many different people and places into my life, many changes have been so swift, I never knew they took place. Sitting in those big green chairs once a month has truly changed me. So we can kick and scream about change, whine and complain until we are blue in the face.......but it is there, smoothing, roughing up, caressing and kicking.......nothing can stop it, all those we love, all those who drive us crazy, all the beauty, the ugliness, the good and the bad that we feel and see.......play a part in who we were yesterday, who we are today......and who we become tomorrow. "The cure for anything is salt water......tears, sweat, or the sea." When we were kids, if we ever had a sore throat, stuffy nose my mom brought out the salt water......gargle, nose spray.....it really did help. Then there are those tears......I have cried tears of anger, joy and sadness.....and yes, shedding those tears always helped. Sweat......I am constantly telling my students that sweating is good for you.....gets rid of toxins, makes you feel alive. The sea.......when I was younger, I loved the warm Emerald green waters of the Gulf of Mexico. My dad always said those waters were healing. As I grew older and traveled to the West coast, I became enthralled by the roughness and chilly waters of the Pacific, and then I visited the Northeast and fell in love with the Northern Atlantic. And then, there was the Irish coast......rocky, fierce and magical. I no longer crave the tropical seas as an adult, but oh how I love rough, jagged coasts and brisk winds. I feel fearless when I face a sea that taunts, with winds that chill you to the bone, and the salt spray that stings your face. Something about that stirs my creative energies and lights the fires in my soul. It rids my head of fogginess, destroys depression and self-doubt......it is a salve that never fails to soothe and heal. I think salt water....... tears, sweat or sea possibly is the cure for whatever ails you. By noon today I had cabin fever......we walked awhile first thing this morning, but rain drops began to fall, we made a mad dash for the house. We haven't been home much the past few weeks, it was time to visit the grocery store......and my knees were no longer wobbly from the treatment. By the time I dressed, it was noon and the rain had become a much welcomed steady downpour. and potatoes......she loved cooking that dish in the fall and winter. I often miss my mom most when there is food involved........she was a great cook, and she passed the love and art of cooking on to me and my siblings.....we all love to cook. There are so many times in my kitchen when I think of her and am grateful for the kitchen skills she demanded we all learn. To cook with love was her first rule, her second......never be afraid to play with a recipe......sometimes her creative ventures with cooking got a little strange, but often they were wonderful. Tomorrow, my sister and brother are coming over to eat her rib dish......there will be some laughter and memories and as always since she died, a little sadness.....but the food will be cooked with love, and she will be remembered with love......and maybe a cold rain will fall. Ok, Jordan calls and says he needs some help with an art project. 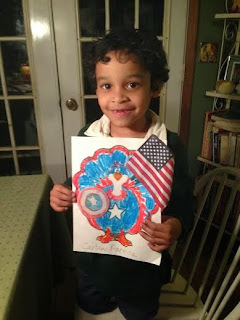 He has to decorate a turkey for Thanksgiving.......he wants it to look like Captain America........I google Captain America, I find a small flag, we make a shield out of foam, bring out the markers......and there you are, Captain America Turkey. I admit, it was loads of fun and I would love to see what the rest of his class did with their turkeys. He did say that one of his friends glued q-tips on his and made a skeleton. This project brought back memories of school projects from my past.....the most unusual one I ever made......a bark wigwam. Hulk might be fun, and since he is green and red.....we could use him for Christmas too. An afternoon with Jordan is great medicine.....I suggest you all decorate some turkeys. Treatment # 23 today, my chair buddy Louis, finally let Rick take his picture with me.......he is rather camera shy. Louis is a golden ray of sunshine in that often gloomy room. Everyone smiled when he walked in today. We had a new person join our group today, her first time, she was nervous. She sat by me, we talked about her diagnosis, and how many treatments she would be having. I explained that I had been sitting in those big green chairs almost two years, that I called our three nurses, blue angels and that there was much love and caring in that big scary room. Another chair buddy has passed on, since I was there last......at least I know he no longer suffers. My sister worries about the friendships that I make in those big green chairs......many of them are no longer with us......and I do tend to care with all of my heart. But I choose to believe I sit in that big green chair for a reason, and you can't not care for someone because they don't have much time. Louis has become one of my dearest friends, we call to check on each other, he calls Rick to argue football( they pull for opposing teams). I would never have met him, never had known his kindness if not for those green chairs. I told him once that meeting him was worth every hour spent in the big green chair. He has been sitting in those chairs over fifteen years.......he is there for a reason also. Classes today were a little subdued.......I think the change in the weather took its toll on everyone. The temps have fallen most of the day, a strong cold wind came out of the north and to quote my niece Samantha, "it's raining leaves." At times the leaves were so abundant blowing in the wind, it did seem as though it was raining leaves. Funny how the weather can affect our bodies as well as our spirits.......causing aches and pains, and everything from joy to depression. The past couple of weeks, our travels have taken us across eight states and three time zones......we have experienced snow, rain, wind and sunshine, warmth and freezing cold......I have felt very out of sorts the past few days, maybe I should blame it on the weather. Here in Alabama tonight and the next couple of days, old man winter has paid us an early visit, but by Sunday, balmy 70's and thunderstorms are coming to visit......"a change in the weather, is bound to be extreme." Even Bob Dylan knew something about the weather. I hope where ever you are tonight, your weather is not so extreme. Veteran's Day........a thank you to all you Veterans......thank you for your service, your sacrifice, your willingness to face danger, your love of country. Wishing you blessings of peace each and every day, wishing you a life of joy.......grateful for all of you. Kindness.......I am amazed when I witness it, I am brokenhearted when I see it ignored. The quickest way to lose my respect.......purposefully treat someone unkind. We are all living human beings, searching for warmth, shelter, food, love and kindness. We all experience bad days, we all have dark moments, we all at some point surrender to anger.......but even in the worst of moments, try a little kindness.....it works so much better than harsh words. Rick and I were in Johnson City Tn for the Johnson City Folk Festival this weekend.......and kindness seemed to be almost epidemic. Everywhere we went, people were so kind. It was a long hard trip, exhausting yet so rewarding......the kindness of strangers was a refreshing comfort. The hotel where we stayed, the musicians we met, the audience who listened to our music, the gas station attendants, and the Krystal where we had breakfast this morning.......it seemed a wave of kindness swept across the city and caught us right smack dab in the middle of it. We came home tired, happy and beaming with goodwill and love for our new friends and their home town. Maybe it's the mountain air, or cold streams or the altitude, but their kindness made us want to spread a little of our own......wouldn't it be nice to start an epidemic of kindness this week, to spread a blanket of kindness from my hometown to yours, to touch every person we meet with kindness.......an epidemic of kindness.....it could happen. is to " sail" out, to reach out to those who are unloveable, to the needy, to those in pain and offer them shelter on stormy seas. A good friend and I talked for a while this morning, it's interesting, when I need a good strong ship on stormy seas, he seems to magically appear......and hopefully I do the same for him. I hope tonight, what ever seas you are sailing on that they are calm, that your voyage is a safe one, yet exciting and that one day we all find the harbor we yearn for. Rick mentioned to me this afternoon that in the past week, we had been to seven states and three time zones........no wonder my body is screaming at me. We played a beautiful folk festival today, incredible music, lovely people and surroundings that looked like picture perfect post cards. The highlight of my day ( well besides playing two shows).....petting a deer, seeing a white peacock, and hanging out with good friends. Tonight, a cup of hot mint tea is my best friend, taking care of my throat.....two more shows tomorrow. So sorry for the short post, I am a wee bit tired......more tomorrow night. Back to teaching today, almost two weeks now.......first vacation, then sick.....actually, I was sick on vacation. I love teaching, and I had missed it very much. It felt good to be back with my students, breathing, moving and meditating. Tonight as I drove home, a beautiful white owl flew down in front of me, sat on the side of the road and blinked his eyes......I felt honored that he acknowledged me. He was so beautiful, so serene. His eyes were big and bright, he really did look all knowing. We have gigs all weekend, really looking forward to the music and friends. Wishing you all a weekend full of joy, laughter and much love. 1. Life is 10% of what happens to you and 90% of how you react to it. 2. The most painful thing is losing yourself in the process of loving someone too much, and forgetting that you are special too. 3. It’s better to be alone than to be in bad company. 4. As we grow up, we realize it becomes less important to have more friends and more important to have real ones. 5. Making a hundred friends is not a miracle. The miracle is to make a single friend who will stand by your side even when hundreds are against you. 6. Giving up doesn’t always mean you’re weak, sometimes it means you are strong enough and smart enough to let go and move on. 8. If you really want to do something, you’ll find a way. If you don’t, you’ll find an excuse. 9. Don’t choose the one who is beautiful to the world; choose the one who makes your world beautiful. 10. Falling in love is not a choice. To stay in love is. I read these ten musings and thought, wow.......life lessons that should be shared. Hope you enjoy them and embrace them, I think they are worth remembering. The Aspen trees had not even dropped their leaves of gold, when the early snow storm hit Jackson WY last week.......the second morning we were there this was our view from our window. It was a beautiful precious gift from Mother Nature.....she knows how much I love the snow. Every where we looked, it was post card perfect. Snow.......it brings a silence that is as beautiful as any song the songbird sings......it brings a stillness that is a mix of peace and love.......it seems to cleanse and purify in a way that rain cannot. 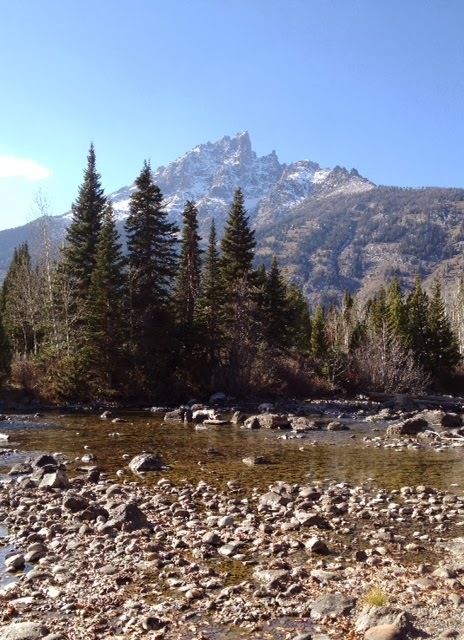 We spent last week in Jackson, WY with friends......it is a beautiful place. 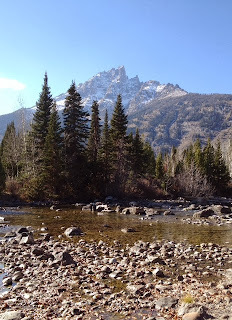 Seeing the Tetons, and Yellowstone National Park was amazing. Wish you all could have been there. The Tetons were snow capped the first day we arrived by our second day there, everything was snow capped. I saw this on Face Book, it made me laugh......but it is pretty much how I feel about Daylight Savings. I have never liked it, it has never made sense to me. I think it contributes to our crazed thought process of never spending any time in stillness of always looking for some way to go as hard as we can 24/7. I believe we have messed with our bio-rhythms and inner time clocks so much our bodies no longer know when to work or rest. Fall and winter, the shorter days, longer nights.......it is a time to slow down, and rest not only for nature, but I think for humans as well. We need the contemplation, the starkness and bareness, the darkness, to remind us of growth and rebirth.......and to be grateful for the longer, warmer more fruitful days of spring and summer. This switching, this turning back, springing forward......what a waste of energy, and I think quite a bit of arrogance. My friend Charlie, always said "without your health, you have nothing." Both quotes are quite true, you can still have family and friends and many do still create and are productive, but it is all so much better with good health. Health is something that we all take for granted, until we begin to lose it......and then we understand its true value. My wish tonight, my prayer tonight.......may we value our health, may we all keep it for a very long time. November 1.... this month is the eight year anniversary of my mom's death, I realized on the way to her funeral, that the leaves were in their glory.....her favorite color was red, and there were red leaves everywhere.